What is a blue light filter? Also known as night mode, this handy function is available on many Android smartphones. It allows you to apply a filter to the screen, minimizing eye strain and reducing the blue light emitted by your smartphone screen. In this article, we’ll tell you how you can activate this function in your settings, and recommend a blue light filter app in case you can't. What is blue light filter and why do we need it? Why do we need a blue light filter? More and more users are having problems with eye strain due to the amount of time they spend in front of screens. It’s not surprising when you consider our modern lifestyles (staring at the TV, computer, smartphone, tablet, etc.). Eye protection mode, as Huawei calls it, is an effective way to reduce blue light. It has a negative impact on sleep as it disturbs the production of melatonin, an essential sleep hormone. Fortunately there are ways to reduce your exposure to blue light, either in your smartphone's default settings, or via a blue light filter app. Recognizing the importance of this mode, Google decided to integrate it into newer versions of Android such as Android Oreo. The latest, Android Pie, also has the night mode function. So long as your phone has reasonably up-to-date software, you can enable night mode like so. To activate it, just go to Settings > Display > Night Light. You can also configure it so that Night Light will turn off automatically at certain times. 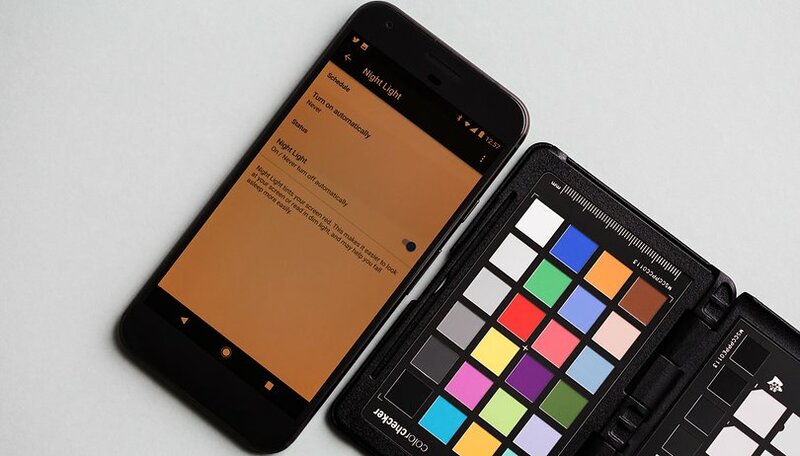 Other manufacturers aren’t waiting around for the next Android update to introduce a Night Mode or Blue Light Filter on some of their phones. This is the case for Honor, Huawei, Asus, OnePlus, Samsung…generally, all you need to do is just go to Settings (then usually Display) or the shortcuts to activate it. Most of these night modes can be scheduled, usually with an automatic setting designed to activate at sunset and switch to 'normal' light at sunrise, but you can customize it to your preferences. So, you've looked through your current phone's settings and it doesn't appear to have a night mode. This can happen, especially if you're on Android One or stock Android, without any extras added by Google or the manufacturer's UI. You shouldn't worry though. At the moment there are a number of apps available on Google Play that allow you to achieve the same result. One of the most popular ones around at the moment is Bluelight Filter. It has the same functionalities as those you find on Android, with even more options - selecting the filter color from seven available shades, shortcuts on the home screen, a notification widget and an activation time schedule. If you do a lot of reading on your smartphone or tablet, then it's better to do it using a dedicated e-reader app. Not only do these apps offer a range of convenience features, but many also integrate a blue light filter to ease the strain on your eyes during your nighttime reading. One of our favorite e-reader apps, Moon+ has a great blue light filter features integrated into the app. Google Play Books also has it in the form of its own Night Light settings. Night mode is great for bedtime reading. Do you use a light filter on your smartphone? Do you find it helps minimize eye strain? Let us know in the comments below. Somehow I never got either DND option or night light to work properly on Android. It is almost as if they turn on & off on their own. It's a lot easier, people. Night Mode can be accessed using the Google Play Books App settings. It's that simple. First, is it safe for the screen to use those apps from the play store ? 2nd from my experience of 3 years using a screen filter, the best is Réduire Luminosité l'écran, it does not put a filter, it just reduces the brightness more than your phone gives you from settings. I have an S4 mini (android 4.4.2) for 3 years now. I used the Blue Light Filter downloaded from the Play Store, I really liked it, but when my phone completed a year of usage, the display got wierd, it looked divided in half and the colors were wrong. I took it to a technical assistance and the display had to be changed. OK, the job was done. I don't know what damaged the display, but I suspect it had to do with the app filter. I never used it again, and the problem never occurred again. Maybe it was the app, maybe it wasn't. I would say it's not safe... I'm only using again when it's a native app from Android. You just messed up your settings the technician had put them in right setting back. no material defect, just an unskilled user with the wrong settings. bluelight from phone settings or app will never damage a LCD screen. A so-called bluelight filter is supposed to reduce strain on your eyes if you are in the habit of using your mobile phone for long hours, especially if you use it to read extensively. However, the medical justification for this kind of thing is still controversial. Some people solve this issue by using an ebook reader like a Kindle for reading. In my experience, installing and using an app for bluelight filtering is not an option. All the apps available are too crude or have intrusive adds or are not well-integrated into the system. Only the Nougat filter is worth using. Even the much-touted Twilight is worthless. Such things need integration into the operating system, not an app. That should perhaps teach us that basic smartphone functions need integration into the ecosystem, not imposed by an app. I use it on my phone and find it helps at night when my eyes are tired. Bottom line is it's supposed to help if you plan on going to bed because the blue light is supposed to make it so that it's more difficult to fall asleep. Nearly all my long form screen time is on ereader apps like Kindle, Moon+, and the RBDigital magazine app - except for that last, I can choose a background/foreground format that's comfortable and don't want Android or some other app to fool with it. Don't want discoloration and dimming of photo or video viewing or editing, or digging into system settings to turn it off and on for different applications.